For any parent, having a sick child can be a scary experience. For Claudia Rodriguez and Arturo Figueroa of Stockton, California, it’s simply terrifying. This is because their two-year-old son Ayden suffers from febrile seizures, meaning any time there is a slight elevation in his body temperature he goes into convulsions. While pediatric febrile seizures are the most common childhood seizure disorder, it’s still very distressing for Claudia and Arturo anytime that Ayden starts to come down with a cold or virus. Ayden’s first seizure happened when he was just over a year old, but luckily, for him and his family, an amazing team of clinicians were right by his side to help. It all started one morning last January. When Ayden woke up, Claudia noticed he was feeling a little feverish. Assuming he was just coming down with a cold, she gave him a dose of Children’s Tylenol and then got him ready to spend the day at his grandmother’s. But not long after she dropped Ayden off at her mother’s house and headed to work, Claudia received a panicked phone call. Ayden’s fever had spiked and he had started seizing. His grandmother immediately called 9-1-1 and the paramedics had taken him to San Joaquin General Hospital in French Camp. By the time Claudia and Arturo arrived at the hospital, Ayden had suffered so many seizures that he was having difficulty breathing on his own and had been intubated and placed on a ventilator. Because San Joaquin General isn’t equipped to care for Pediatric Intensive Care patients, Ayden was going to be transferred to another facility. Knowing that time was critical, the team at San Joaquin immediately placed a call to REACH’s 24-hour communications center to request a helicopter to fly Ayden to UC Davis Children’s Hospital in Sacramento. REACH 2 in Stockton got the call that day. On shift was Pilot Brandon Edeal, Flight Nurse Kasey Harris, and Flight Paramedic Brian Cross. 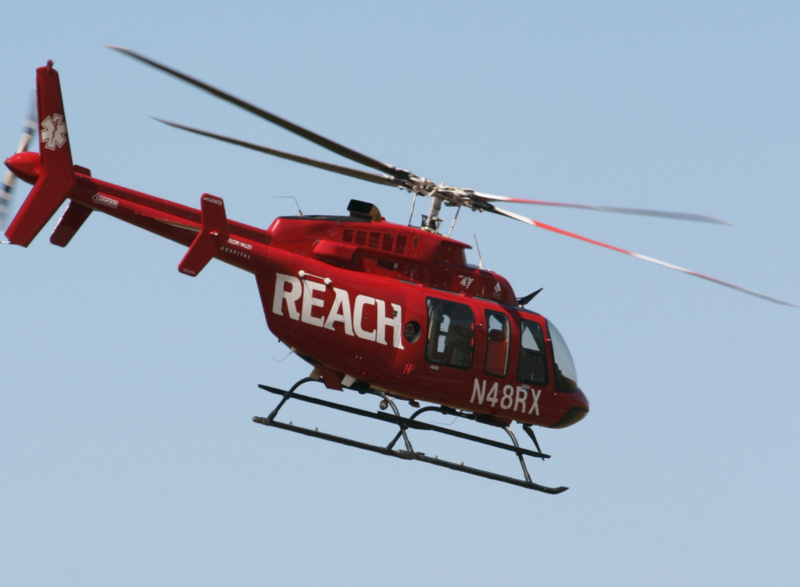 REACH 2 departs on a call. “When we got there, Brian and I immediately knew that we had a lot of work to do to get the baby ready for transport,” said Kasey. After introducing themselves to Claudia and Arturo, Brian and Kasey set to work on preparing Ayden for the flight. They soon realized though, that this was going to be a delicate balancing act. While Kasey and Brian worked hard to stabilize Ayden for the flight, they did their best to help keep Claudia and Arturo up to speed on what was happening with their son, but as any mother would be in that situation, Claudia was frantic. Brandon has been a Pilot with REACH for almost two years now, and he has learned that even the smallest of gestures during stressful moments can help his colleagues, the patient, and the patient’s family. After taking a quiet moment in prayer together, a sense of calm finally came over Claudia. Before Kasey and Brian had finished preparing Ayden for transport, they informed Claudia and Arturo that they would need to get a head start to Sacramento in order to be there when Ayden arrived. “Unfortunately, because of the seating arrangement in the helicopter, Ayden’s mom and dad weren’t able to fly with us,” said Kasey. After getting reassurance from Brandon that they would call as soon as they landed safely at UC Davis, Claudia and Arturo hit the road for Sacramento. By the time that they arrived at UC Davis, Ayden was being delivered to a room in the Pediatric Intensive Care Unit. In total, Ayden spent three days in the PICU with his mother and father by his side. His recovery was slow at first, but by the third day of his hospital stay, he really started to bounce back. Despite still suffering from his seizure disorder, Ayden is now a happy and very talkative two-year-old. “He is a real character,” said Claudia with a slight chuckle. Claudia holds hope that Ayden’s doctors are correct in their prognosis that he will likely grow out of the seizures. But for now, she is just thankful that Kasey, Brian, and Brandon were there to help her family.